Larry Poff was a regular on local sports television and talk radio. Now he's beloved once again by Philly fans on Twitter. Larry Poff, center, was once a regular on CSN Philly and local sports radio as a reactionary Eagles fan. Now, he's found renewed fame among Philly fans thanks to Twitter. I met Larry Poff in the D parking lot of the Wells Fargo Center, or as he referred to it, "the Wachovia," the name the Sixers and Flyers arena went by until 2010. The 53-year-old union contractor from Lester, Delaware County, isn't particularly distinguishable from the sea of Eagles fans who've arrived more than four hours early to tailgate a divisional game against the Washington Redskins on Monday night. 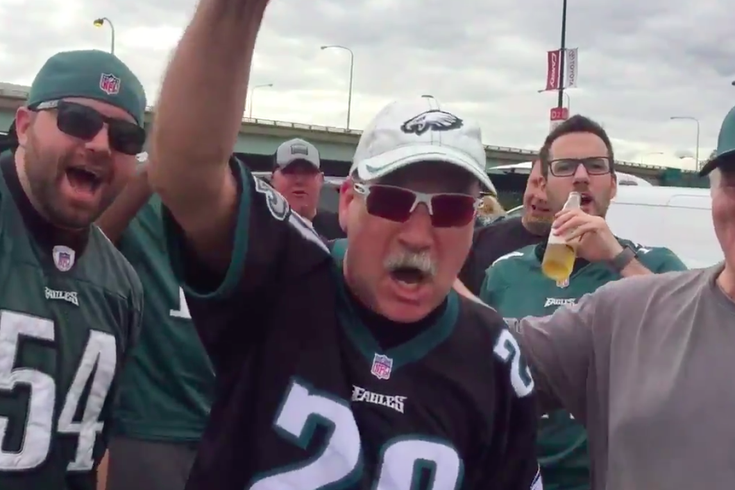 He's wearing a black Brian Dawkins jersey, dark sunglasses and an Eagles baseball cap, with a terse, Philly-area accent thick enough to drizzle on an Italian hoagie — pretty standard for a gray-haired Birds fan. Poff, of course, is not your average Eagles fan, or else you wouldn't be reading a story about him. His string of beer-infused Birds rants on then-CSN Philly (now NBC Sports Philadelphia) and local sports radio are stuff of legend and have once again received adoration in the age of Twitter. Poff only became aware of his renewed fame about three weeks ago when friends started to send him the videos that were resurfacing. He didn't think much of it until about a week after that when his daughter informed him she had seen T-shirts about him being sold. "I said 'No way. I can not believe it," Poff said. "And she goes, 'I'm not kidding, they're selling T-shirts! You gotta look!'" It all started back in 2003, when the Eagles lost the NFC Championship game to the Carolina Panthers, 14-3, prompting an angry Poff to leave Lincoln Financial Field shouting "three-stinkin' points," which landed him an interview on CSN Philly. His pure frustration must have stuck with the network's producers, who spoke with him again after the Birds beat the Minnesota Vikings in the playoffs on their way to a Super Bowl run. "I seen a guy from Comcast, and I said, 'How about you interview me this year when they won? You interviewed me last year.' And the guy says, 'Don't tell me you're the three stinkin' points guy!'" "It's so indicative of Philadelphia sports fans' passion, (at the time) we were all in on the Jeff Garcia movement." Poff became a regular reactionary voice — win or lose — on CSN Philly, particularly on Angelo Cataldi's show at Chickie and Petes. "It was crazy," Poff said. But the attention eventually fizzled out — until now, as Poff has become an internet mascot of sorts among Eagles Twitter. "I love it, I mean I think it's great," he said. "Of course, my wife could care less." Poff owes his entrance back into the spotlight to Jeff McDevitt, a 29-year-old Eagles fan originally from Delaware County as well. McDevitt used to do videos for Drexel University's athletic department, where he had plenty of creative freedom. After accepting a job with WWE (a dream job that the lifelong wrestling fan loves) and moving to Connecticut, he was looking for a new outlet to flex that creativity. So he decided to channel it with silly, short Eagles videos on Twitter. Before the season started, he tweeted an excerpt from an interview with Poff after the Eagles and backup quarterback Jeff Garcia beat the New York Giants in the 2006-07 playoffs. "He's our baby, he's it baby!" Poff exclaims in the video. "I thought a couple of my friends would find it funny and that was it," McDevitt said of the clip. Nope. It blew up and has become a popular meme for a team that's started 5-1. "It's so indicative of Philadelphia sports fans' passion, (at the time) we were all in on the Jeff Garcia movement," McDevitt said of the video. It was a snapshot of the unwavering hope of the city's fans; few probably remember a single pass Garcia ever threw, McDevitt noted, but in that moment, Poff — and the rest of us — believed 100 percent." Since the whole thing has blown up, McDevitt has connected with Poff via his new Twitter account. Poff has been feeding him videos of past interviews, while Poff tries to navigate a social media platform he's unfamiliar with but is trying to learn after it propelled him once again to stardom among Eagles fans. "I guess I have to now," Poff said of becoming active on Twitter. "It's not an option — as long as someone teaches me how to do it." So, why has Poff's brash, enthusiastic and at least slightly intoxicated style stuck? McDevitt has a theory. In an age of some so-called super fans using their fandom "as an engine for yourself" through videos and blogs, Poff's love of the Birds comes off as the opposite. "There's something so pure about it that everyone likes about him," McDevitt said. McDevitt was hoping to meet up with Poff before Monday night's game and snap a picture with him. For his part, Poff predicted a 37-17 win for the Birds and recreated the Garcia interview per my request for Carson Wentz and the 2017 Eagles (a video he later admitted on Twitter he may have been a bit too sober for). "Wentz is our new baby, of course," Poff said.